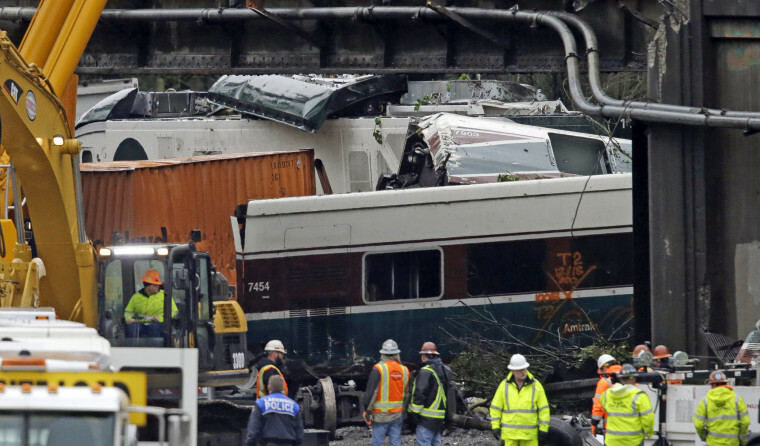 A conductor was in the cab with the train engineer during an Amtrak train's deadly derailment in Washington state, federal transportation officials revealed Tuesday, adding that the train's brakes were eventually engaged automatically, not by the engineer. "Absolutely distraction is one of our most-wanted-list priorities at NTSB," National Transportation Safety Board member Bella Dinh-Zarr said at a news conference, although she added that the federal board has not determined a cause of the deadly accident outside Tacoma. Three people were killed when the Amtrak train headed from Seattle to Portland, Oregon, careened off a bridge at around 7:33 a.m. PT. The train was speeding, traveling at 80 mph in a 30-mph stretch of track, investigators have said. All of the crew members on the train were injured and were hospitalized, and investigators are making arrangements to interview them, Dinh-Zarr said. A conductor "who was getting experience and familiarizing himself with the territory" was in the cab with the engineer, she said, while the train's actual conductor was in the passenger area. Being familiar with the territory is one of the duties of the conductor, she said. "As far as exactly what they were doing, we will be talking with them and finding that out," Dinh-Zarr said. It is standard protocol at the NTSB to look at all of the cellphone records of all the crew members after an accident, she said. Data recorders have been recovered from the rear and lead locomotives, Dinh-Zarr said. The lead engine’s inward and outward facing cameras have also been recovered but “they were, unfortunately, significantly damaged — you saw the terrible destruction of this accident,” she said. The train was slated to get Positive Train Control — technology that can automatically slow or stop trains traveling too fast — but it had not yet been installed on that train, Dinh-Zarr said. The NTSB has long recommended that all trains feature the technology, but Congress pushed back a deadline for installation that had been set for the end of 2015, and instead gave train companies until the end of 2018 to put the systems in place nationwide, Dinh-Zarr said. The corridor where the train derailed was set to get Positive Train Control fully installed by next spring, The Seattle Times reported Wednesday. But Washington state transportation leaders appeared to want the line up and running sooner in order to meet a deadline to collect federal stimulus money. That's why the route opened Monday, ahead of that train safety technology being installed. A state Department of Transportation did not have an immediate comment on why the project's completion couldn't have waited a few more months. On Tuesday afternoon, Washington Gov. Jay Inslee vowed to investigate what went wrong and what can be done to prevent other accidents, and urged people not to jump to conclusions. "All of us owe a debt of gratitude not only to the professional first responders, but to the volunteers who got out of their cars and helped their fellow Washingtonians make it through this tragedy," Inslee said. There were 83 people on board the train, including 77 passengers, 5 crew members and a technician when the train derailed, Amtrak's president and CEO said. "I saw the train hanging off," said Daniel Konzelman, an Eagle Scout who was driving by. He said he and others put on headlamps and sprinted along the tracks to reach the train and helped people down to the freeway. He also climbed into a car through a broken window to see who needed help. "A lot of people were in a lot of pain," he said. But Konzelman downplayed his heroism. "I don’t know," he said. "If it wasn’t me, somebody else would have been there to do it, so I was just thankful that I got to be there helping." But Inslee said Tuesday that there is no evidence yet that infrastructure was to blame. "So the president did not follow my advice, which is let's not to jump to conclusions before we make decisions," he said. Amtrak President and CEO Richard Anderson said Tuesday night that the company is dedicated to supporting the victims and ensuring that another accident does not occur. Related: What can engineer of deadly train derailment reveal to investigators? "We have to keep this as a wake-up call. It’s not acceptable that we are involved in these kinds of accidents. We’re terribly sorry to the people that are involved," Anderson said. He said that it is acceptable to have two qualified people in the cab of a train or one person, and the other person who was in the cab was a trained conductor going through a qualification process. He said the NTSB investigation will determine whether positive train control would have prevented the crash. "We share a real sense of urgency with everyone involved in getting to the root cause of the accident," he said.